The Logan Street Bridge project will be under construction through September, causing restrictions on Ind. 19, Logan Street and on White River. Restrictions in the area of Ind. 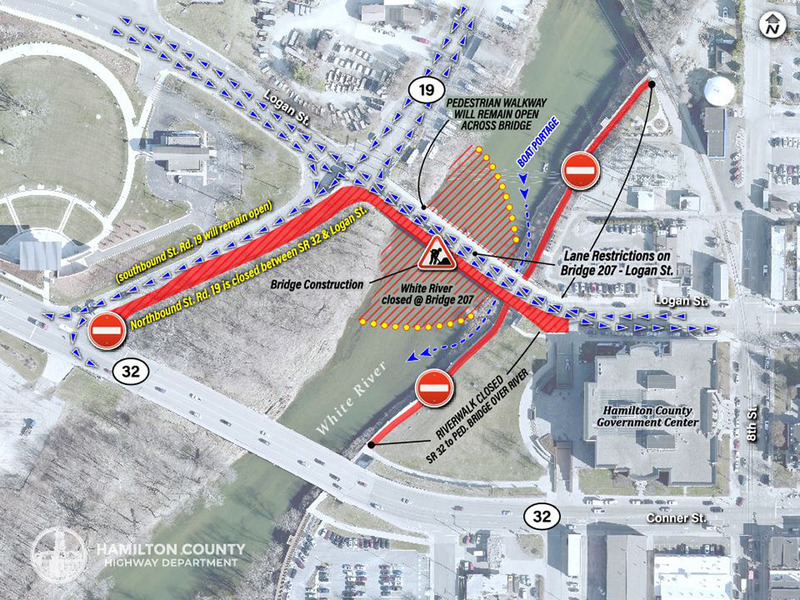 19 and Logan Street aren’t new to drivers in Noblesville, as the project to add a pedestrian pathway to the south side of the bridge over White River began in October. Now, the river is restricted for river traffic under and near the bridge as work continues. The $4.5 project work is expected to last through September and is a joint project between Hamilton County and the City of Noblesville. Both entities say the goal of the project is to provide safer pedestrian connectivity from the downtown square to the Riverwalk and Federal Hill Commons. Other restrictions from the project include the northbound land of Ind. 19 between Ind. 32 and Logan Street, along with a minimized eastbound lane on Logan Street from Ind. 19 to just after the bridge before the Eighth Street intersection. Butler, Fairman & Seufert has been contracted as the design and inspection firm on the project. ICC Group is handling construction, and R&M Electric is handling lighting.